Andrew Smith had the most liked content! Originally joined the Register in 1984 when I owned a 1973 TR6 (OPC 310L) and another 73 TR6 (NAP 966M), then a basket case 68 TR4A (NHA 717F) and then another 68 TR4A (SUV 407F). 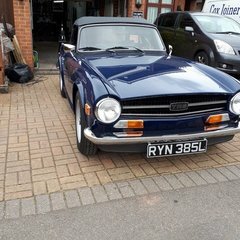 Have recently found OPC 310L (TR6) and SUV 407F (TR4A), anyone know the whereabouts of my other TR6 (NAP 966M) and TR4A (NHA 717F)? Farnham, Surrey (uphill from Baldrick) - but West London born and bred! Edit: actually, Saffy was built on 8 August 1970 which was a Saturday - you can't beat a bit of overtime! If you think that was bad, here's how they painted the matt black grille surround with a paintbrush..........I could give plenty more examples, but Saffy's no longer mine and sits in a private collection in Japan. That said, it's the evidenced story and reach-back of how these cars were put together back then and all rather endearing really.